Hi, I have a Blade Electron Mark-V which has stopped charging. There is power at the AC power cable going to the charger but no LED's come on. Any one know where I could have it repaired/replaced or happen to have a replacement charger for sale? I am in Belmore Sydney. Thanks. I've replaced one in a Blade Electron here in Brisbane and am about to replace another one. I buy them direct from TC Charger in China. Email Nancy Loo "Nancy TC charger" <export2@tccharger.com>. TCCH-H360-6 with no CAN bus interface. They are about AU$1000 depending on the exchange rate. Paid in advance by international funds transfer in USD to their Chinese bank account. BTW, Do you have two TC chargers in your electron? If so, you can probably get by, by disconnecting the faulty one. The other Electron owner tells me it is quite possible that you may have a different number of cells. This could be determined fairly accurately by measuring the total battery voltage when it known to be between 85% and 90% SoC and dividing by 3.33 V, or when it is known to be between 45% and 60% SoC and dividing by 3.29 V. This assumes they are LiFePO4 cells. But be aware that this is a lethal voltage, and don't attempt to measure it unless you are sure you can do so safely. There is only one charger. There are 56 90Ah cells. I will count them again to be sure. Ordering one from China will be my last resort to a local fix. The charger has what I believe to be a CAN box attached to the charger via a seven pin plug. Is there an advantage to getting a charger without the CAN interface for the BMS? I assume the BMS will stop an over charge if the charger fails to stop charging/ one cell goes over voltage. Thank you for the direct contact to the supplier/manufacture in China. chris wrote: There is only one charger. There are 56 90Ah cells. Ah. Then the Mark V must have a rather different drive train than the earlier models. At first I thought that there must be another battery box somewhere, but I read that the Mark Vs have a 16 kWh pack. At 90 Ah, that's about 16,000 / 90 = 178 V, call it 180 V nominal. 180 / 3.2 = just over 56 cells. So that must be it. So unfortunately, the information above re the 100 cell charger won't apply to this model. Hopefully, there will be enough information on the manufacturer's label to figure out what to replace it with. Or maybe the microprocessor inside is still OK, so it still has the charge parameters intact. It's not clear to me whether or not your charger will be a CAN model or not. The 7-pin round connector is used on other Blade models to connect the red/green LED remotely, and possibly to taper the charge or turn the charger on and off. If it is a CAN model, then the entity that sets the charge voltage and current is outside the charger. So then we don't need to know exact finish voltages, etc. I'll PM you with an offer to repair the one you have. No guarantees; it might be beyond repair. I do have the schematics, I know the firmware, and I even have a few of the more commonly needed spare parts on hand. Or do you have a Zivan charger? No it is not a Zivan charger. It looks like an Elcon/tc charger. Pulled the charger off the car today. Labels read SN10121064, 168-10, HD VER 1.7 and CHARGER 217Vmax, input 100-240V AC, Output 217V-10A@240v, Battery LiFePO4, 56 cells, enviromental enclosure IP46, Model TCCH-H217-10. Now to Post it. chris wrote: Now to Post it. In fact, he posted it to me; I offered to try and fix it. When it first arrived, the first test was a sniff test. 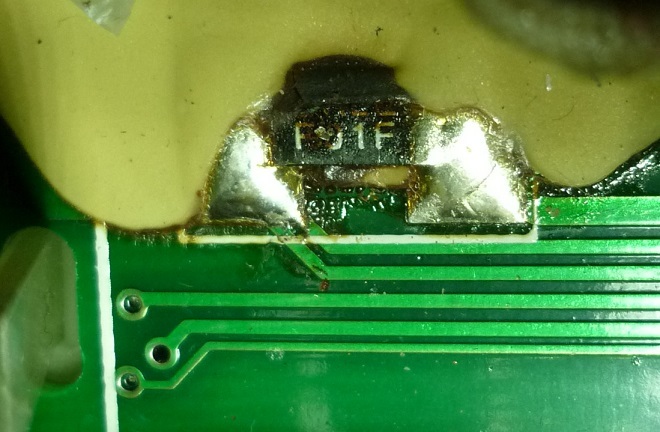 There was a faint smell of burned resistor (burned semiconductor is much the same), but I could not localise it. I shrugged it off; it seemed like it could not be all that bad. I quickly established that there was no 15 V supply, or 12 V. Hence the processor was not running. I foolishly assumed it had to be the Viper20 chip; it is the guts of the power supply. I now realise I should have tested the resistance of the 15 V and 12 V supplies; if it's not the Viper and the MOSFETs are OK, it is possible to not have to remove the PCB from the chassis. 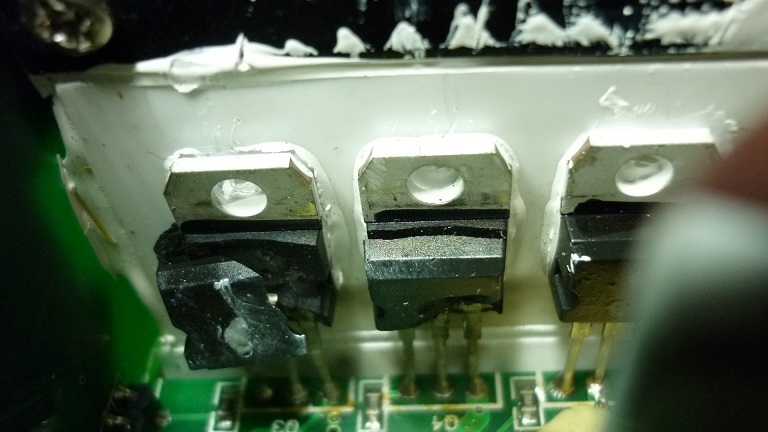 This is a major drama: you have to remove both cables, all PCB screws of course, four screws on the HF transformer, both heatsink clips, and then it's a hell of a fiddle, and inevitably you end up with heatsink goo all over your fingers. The furriness of some of the smaller components is just due to the black gunk that I didn't bother removing completely. Alas, after all this work, it's still not working properly. When I run it with a current limited power supply (50 V @ 2 A), one of the MOSFETs gets hot, and it makes a horrible sound. I removed the associated gate resistor and diode so I could run the charger continuously (before that I had to turn it off after a few seconds of running; while working on it, the semiconductors have no heat sink). The part of the schematic involved (controlling the PWM duty cycle, and involving the SYNC output of the PWM chip, pin 10) is incomplete. So I'm learning as I go. Fortunately, I have a few other chargers here that I can compare with. The 123 kHz switching frequency seems high to me; I'll see if the others switch a bit slower. The second photo shows a 161 V 10 A charger (Chris' is 217 V 10 A). Two 10 mR resistors in parallel gives 5 mR, which at 10 A is 50 mV. This would be multiplied by the fixed gain of the current sense op-amp (30) gives 1500 mV (1.5 V) of output swing. This seems reasonable for a 3.3 V microcontroller, allowing some overhead for overcurrent surges. With the single 10 mR resistor, this would be 3.0 V for 10 A, no margin at all. So I put 3 amps through the sense resistor (all my power supply will do), and measured the voltage at the sense terminals of the PCB (CONN32S pins 24 and 25). I initially tried just using multimeter probes across the resistor, but the reading varied so much with contact pressure that it was useless. Just shorting the multimeter probes together with the power supply clipped onto the probes yielded some 27 mV; I was expecting to measure either 15 or 30 mV. When I took the time to set all this up, I measured very close to 30 mV with 2.997 A showing from the power supply. So it's 10 mR. It looks like I'll need to get another 10 mR resistor (R01F means 0.01 ohms, the F is the Vishay code for 1% tolerance). Duty cycle: 0-100% pulse width ratio (active to total). Higher PWM ratios mean higher power from the charger. Driver: a special chip for driving the gates of MOSFETs. They can supply several amps for the many nanoseconds it takes to charge up the gate to source capacitance of MOSFETs. 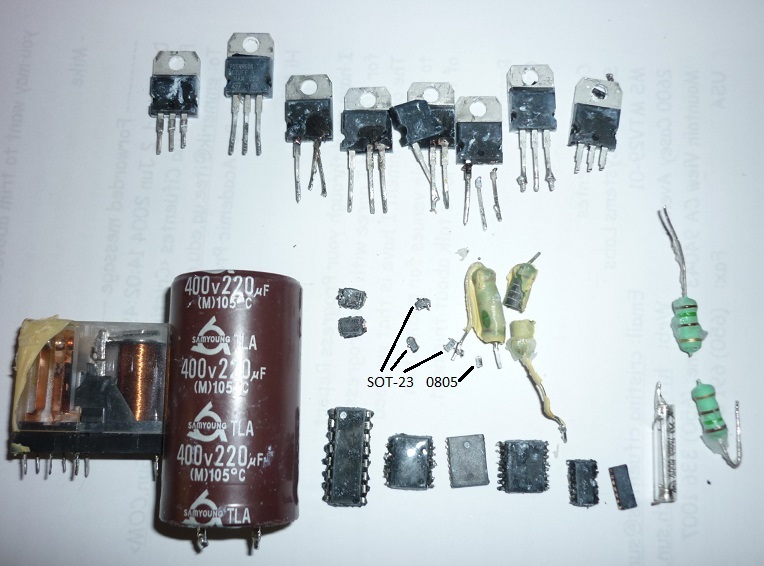 They also provide voltage translation for the high side MOSFETs. NOR gate: a Not OR gate; output is low if either one input OR the other is high. This logic gate is used as a high speed 15 V signal inverter (high in = low out and vice versa). It also ensures that the two upper transistors of the 4-transistor bridge don't conduct at once, though this doesn't seem to me to be important. Op-amp: operational amplifier. These are often configured as fixed gain voltage amplifiers. Vishay is a component manufacturer. Last edited by coulomb on Fri, 19 Feb 2016, 15:52, edited 1 time in total. Indeed, fixing the gate 1 ohm resistors on the main board fixed the weird narrow pulses which were coming from the desaturation protection circuit. So I was able to have the MOSFETs switching at 48 V, and producing some 33 V at the charge output. If scaled up to 385 V supply for the MOSFETS, this would be some 265 V output, more than the charger is rated for. So that seemed good. I took off all my temporary clip leads, made sure the charger PCB was well insulated, and removed J8. 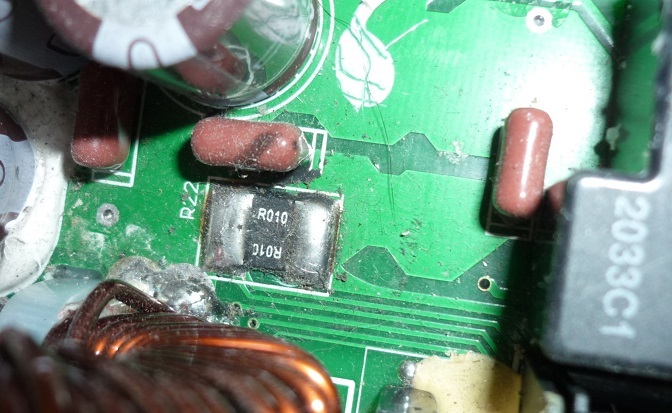 This was stopping the PFC stage from boosting to ~ 384 V. I took some time to clear yellow gunk from the large via the manufacturers provide for accessing GND (negative side of the big capacitors) from the top of the PCB, and decided where I'd access the positive end of the capacitors (there is a bunch of small vias near the MOSFETs; if I choose the ones away from the smaller tracks, it seemed safe enough). I had the power supply limiting to 1 A at this point; it seems it was not enough because one half of the power supply would current limit and go to 0V, while the other half struggled to run the whole charger on its own. I changed the current limit to 2 A, and it settled down. I was able to measure high voltage on the bus, up to about 365 V, and varying a bit. Bit I figured this was mostly the power supply reacting to current surges, and in real life if would probably be fine. Now: how to test. Fortunately, Weber's MX-5 (MeXy) has a pair of battery boxes that comes to almost the right number of cells. The charger is expecting 56 cells; the under bonnet box contains 28 and 26 cells. So if I could wire up some Andersons to connect to those cells, I could test the charger properly. Alas, MeXy has special colour coded finger-safe Andersons, which aren't very easy to come by. Weber has some spares left over, but they are the wrong colour, so they don't fit. He was willing to hack them a bit to fit. In fact, he wanted a special cable to fit these very connectors, so he could run MeXy without the under the bonnet battery box. This could be handy for motor sports events where lightness is more important than range, but also so he can drive MeXy to an automotive air conditioning shop, and get the leaking compressor replaced. It turns out that the same cable, with very minor modifications, could be used to satisfy our different purposes: him to bypass that battery box, me to test this charger. 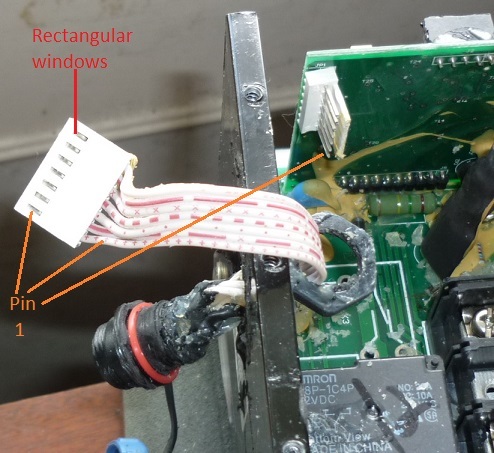 We were successful hacking the connectors, and verified that MeXy would run the motor with that box bypassed. Perhaps Weber will post photos of the completed cable. So now, with a little crimping of Anderson bits and pieces, and a HRC fuse for good measure, I was ready to test the charger. 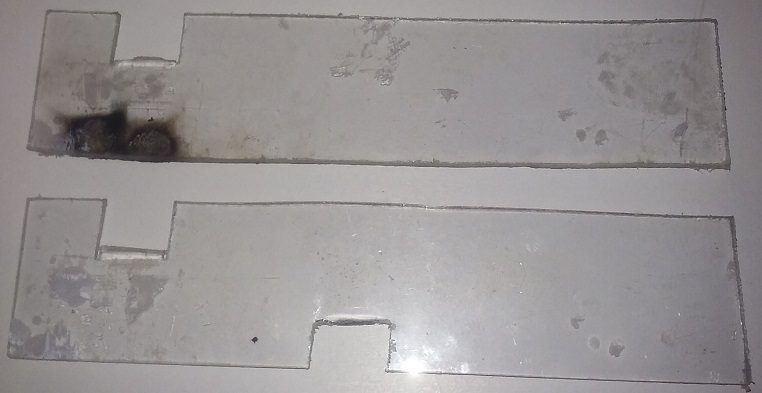 To cut a longish story shorter, an arrangement was made that involved two pieces of 3 mm thick polycarbonate with three cut-outs and three clamps... it was a hell of a bush rescue but I could see no problem with it. I disconnected one of the battery Anderson cables because the processor and the 7-pin round are referenced to the negative end of the battery pack. Weber managed to get a piece of diode pigtail into the correct pins; my eyes weren't up to it, at least not while under the bonnet without magnification. We connected again, and same thing: battery disconnected. What could it be trying to tell us? After some head scratching, Weber pointed out that in fact, the battery was disconnected: we hadn't replaced that Anderson we disconnected earlier. Sometimes what it says is true! Ok, this time for sure. Powered up, some flashing of lights for a few seconds, then a loud bang! A quick inspection revealed that the same two MOSFETs were blown. It looks like whatever provoked them to fail the first time was still present. 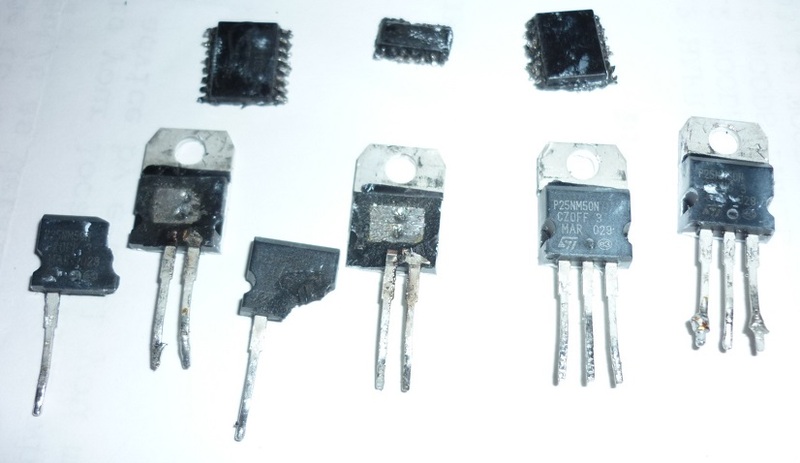 Weber suggested that perhaps some capacitors on the MOSFET DC supply line are not suppressing ringing and glitches properly, and this is causing the MOSFETs to see more than their rated 600 V from source to drain, and this is causing avalanche conduction. In laypersons terms, that causes the bang. I tend to agree with him. I'm also suspicious of a new part of the schematic that I recently discovered is missing. [ Edit: turns out it's not missing, I failed to recognise it. ] The part I traced out makes little to no sense, but there are two small capacitors in the vicinity that may help to make sense of that part of the circuit. In fact, it may well be part of what suppresses the ringing, so it seems very worthwhile to trace it out properly and test more thoroughly at low voltage. So Chris, this means an additional delay of a week or so. PM or email me if this is taking too long. I'm willing to invest the extra time so this part of the schematic is documented properly for all to use, and assuming I can find something to fix in the ringing suppression part of the circuit, I'll put in my last set of 4 MOSFETs that I have in stock. If they blow too I'm ready to declare it as not repairable. You can see a sort of snap shot "photo" of where the two MOSFETs contacted the top bar, "printed" in burned (vapourised?) epoxy. Last edited by coulomb on Sun, 28 Feb 2016, 17:28, edited 1 time in total. I appreciate the effort you are putting into repairing the charger. Hopefully we will have a better result in a week. Good news my charger is fixed. In the mean time I bought a new charger at a cost of $930.00. I now have a spare which should reduce down time next time. All working well. I do have a problem with the new charger. It does not have the seven pin round plug to easily connect to the BMS. It has three wires - power, ground and enable. The old one plugged into a small plastic box labelled TC620 via a seven pin round connector. From this box three wires go into the car and I assume plug into a connector attached to what I assume to be the BMS. Would I be right in wiring up a round seven pin socket to the charger and plugging it all back together? chris wrote: It has three wires - power, ground and enable. What makes you think they are power, ground and enable. There's a possibility they are only red-LED, green-LED and common. I don't know what that TC620 box is either. It definitely isn't CAN bus. But it has to at least be responsible for the bi-colour LEDs in the filler port that mimic those on the charger. Would I be right in wiring up a round seven pin socket to the charger and plugging it all back together? Possibly. But the question is how to wire it up. The first time, I tried to wire in the 7-pin-round from the old charger. I ended up with the LEDs in the filler port blinking red when they should have been green and blinking black when they should have been red, or some strange translation like that. But the owner didn't want me to pull it out again, because it charged just fine. When it came to the second one, I just cut the wires off and siliconed up the gland, and tied the 7 pin round from the TC620 box up out of the way. It still charges. Just no LED blinking in the filler port. 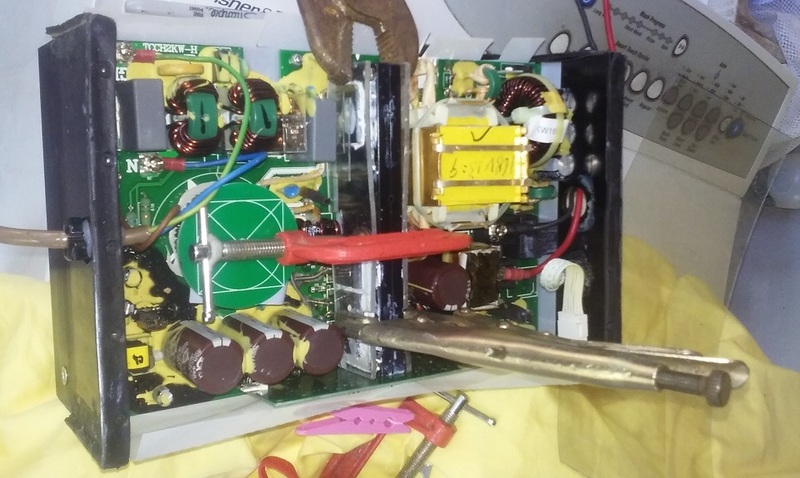 It's quite possible that, as well as connecting to the filler-port LEDs, there is a relay and some resistors in that TC620 box that would drop the charger to a low current to allow balancing when the battery was nearly full. And maybe one of those wires on the new charger is an analog enable that would let it still do that. But clearly the ones I have installed do not get throttled back and just rely on the brief time before and after termination of charge for balancing. So it is important to run a charge cycle on the car at least once a week, preferably every two or three days, even if it is not being used. Last edited by weber on Tue, 26 Apr 2016, 09:25, edited 1 time in total. That's what the instruction sheet has them labelled as. To make the charger work you need to connect the enable wire to the 12V positive wire. It looks like I will not be able to get the filler port led to work then. Still hoping to be able to hookup the BMS to control the charger on off should a cell go out of spec. chris wrote: That's what the instruction sheet has them labelled as. To make the charger work you need to connect the enable wire to the 12V positive wire. OK. Maybe I soldered them together after I cut the wire back. It's been a while. It looks like I will not be able to get the filler port led to work then. It's possible you can get the 7-pin-round fully wired by connecting your own wires to the right part of the circuit board. Coulomb's your man for that. Still hoping to be able to hookup the BMS to control the charger on off should a cell go out of spec. Doesn't the BMS control the charger on/off by means of a relay (in the boot box) interrupting the 240 Vac to the charger? The new one is under warranty so I will leave it alone for now. If the BMS controls the 240V ac then its fine the way it is. I will live without the led working. Thank you for this information. chris wrote: I do have a problem with the new charger. It does not have the seven pin round plug to easily connect to the BMS. Yes, this is becoming a problem. The TC Charger and Elcon sites don't seem to mention the 7-pin connectors any more, or what to do if it's not there. It has three wires - power, ground and enable. The old one plugged into a small plastic box labelled TC620 via a seven pin round connector. Weber and I have searched for information on this TC-620 box, without success. I have found some documents mentioning a TC-615 battery thermometer box, so it seems likely that the TC-610 is a box available from the charger manufacturer (Hangzhou Tiecheng Information Technology Co., Ltd). That's possible. The connectors are rather hard to find; they are made by Weipu and I've only found them available in small quantities from TME in Poland or Octopart in the USA. Where they connect to the control board, they use a 7-pin 2.54 mm spacing connector (about 16 mm wide). and that connector is too large to fit through the 13 mm hole for the connector (plus, the nut won't fit over the control-board connector). Note that the wire for pin 1 is the one with the regular pattern of diamonds. So you'd have to enlarge the hole for the cable to 13 mm (or drill a separate one perhaps), and push the cable I'll supply with the charger through that hole, crimped metal parts first. Push the crimped metal parts into the white connector housing, pushing far enough so that they click into the rectangular windows. Push the completed connector onto the control board (assuming it still has the 7-pin plug as shown in the first photo; I've not seen inside the new chargers). Use some silicone or similar to make sure the connector doesn't come off or become unreliable with all the bumps and vibrations that you get in a vehicle. Tighten the nut over the 7-pin round connector, and use some silicone to seal it against any moisture that might come through the hole or the connector. Last edited by coulomb on Wed, 27 Apr 2016, 09:24, edited 1 time in total. An alternative to the above, but which would not allow the LEDs in the charger port to work, would be to wire the 3-wire cable to the 7-wire cable that goes to the TC-620 box. 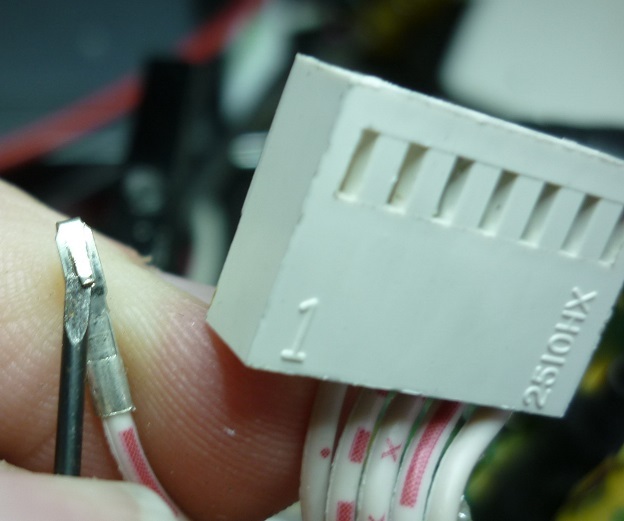 You could chop off the 7-pin round connector and solder them directly, or you could use an in-line socket and wire that to the 3-pin lead from the charger. The in-line socket is Weipu part number SP1311/S7I (note the last letter is capital letter "I", not a one). It is available from TME in Poland and Octopart in the USA. Expect the shipping to cost many times the price of one connector. NOTE: you might expect the mating part to be a SP2310/S7I, but this is not right; that is the female equivalent of the male plug, and they don't fit each other. I have several of these, and can confirm that they don't fit each other. So you want the green wire from the charger to pin 2, red to pin 3 (+12 V), and black to pin 1. The serial communications signals aren't TTL or RS-232; see this post for some clues to using these signals. Last edited by coulomb on Wed, 27 Apr 2016, 09:57, edited 1 time in total. Not all of those were faulty, for example the relay, though it had taken a beating. Oh, and I've just remembered that two large 2.2 uF 400 VAC capacitors are missing from that photo. Hopefully not all charger repairs will be such a long saga. It was an interesting, if slightly wild ride. Thank you for the informantion. I plan on cable tying a fan to the charger with a temperature acitvated switch or a wall wart pluged into the 240V ac to keep it cooler. Adding an led to the circuit is probably all I need. Then again I have been driving a BEV for eight years now. Estimating how far along a charge is, has become second nature. I will probably just look under the car at the charger's led till I get tired of bending down. Thank you for confirming the way I have wired up the charger is correct.